Most recipes in baking begin with instructions to pre-heat your oven, a very important step. I have written about this in brief in my post How To Use A Convection Microwave. A little more in detail about pre-heating a convection microwave in this post. You can also watch my video on preheating(above). Please follow my page on Facebook for updates on new videos for beginners in baking, every Monday! Click here to subscribe to my YouTube Channel. Click to subscribe now! Whenever we bake anything, before we keep the batter in to bake, we need to bring the microwave to the temperature specified in the recipe. This is called as pre-heating. This is an important step and the first thing you do even before you start mixing your batter. We want the oven hot and ready so that the tin with the cake/brownie batter can go in without any delay. Never keep the cake or brownie batter waiting as it can alter the texture. But remember to follow recipe instructions always as there may be a few exceptions. Some cookies and pie crusts can be baked soon after the dough is mixed. Sometimes you may need to chill the cookie/pie dough before rolling and baking. 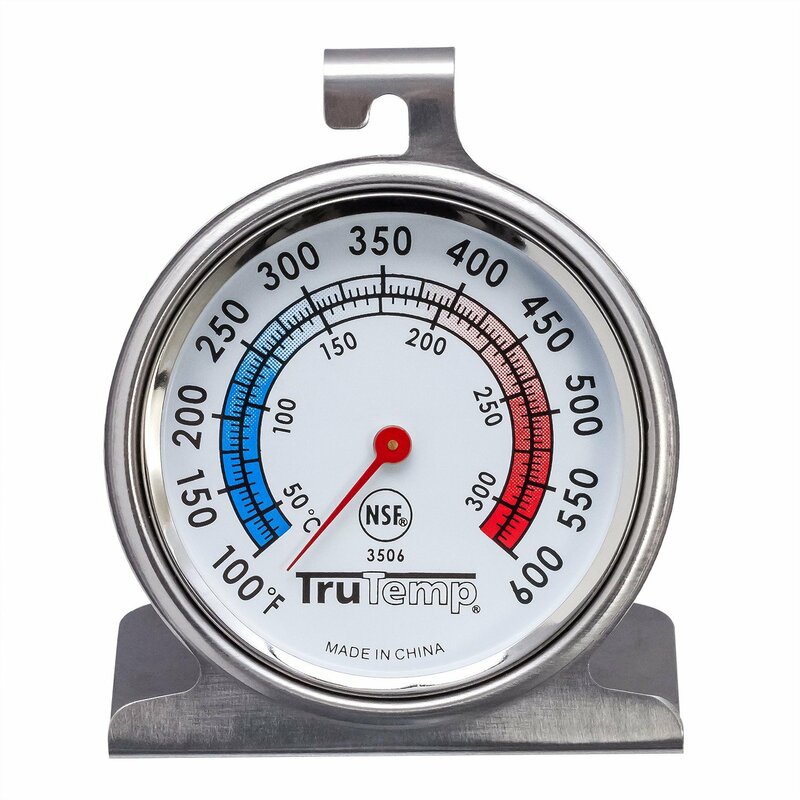 Oven Thermometer: When we talk about pre-heating and oven temperatures, I must definitely mention an oven thermometer. This helps you cross-check the temperature inside the oven. Ovens can sometimes act funny. You set it at 180, the actual temperature may be 200C ! So you may end up ruining your bakes. Get yourself one of a reliable brand, you can buy online, do read reviews from other users. Of course, all of these things are better purchased on Amazon.com if someone can carry it for you. 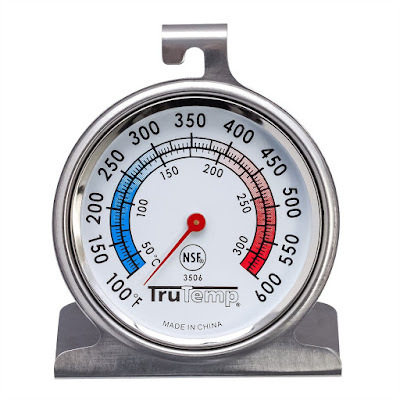 Oven Thermometer Brands I use one by Taylor. Rose Levy Beranbaum, renowned baker and author recommends infrared or point and shoot thermometers. She uses a laboratory cable thermometer from Omega ( model HH22).These thermometers are sophisticated, accurate and yes expensive too! No harm in checking it out and putting it on your wish list though! So here is how I pre-heat my LG convection microwave (MC 8040NSR), please take this as a general guide. 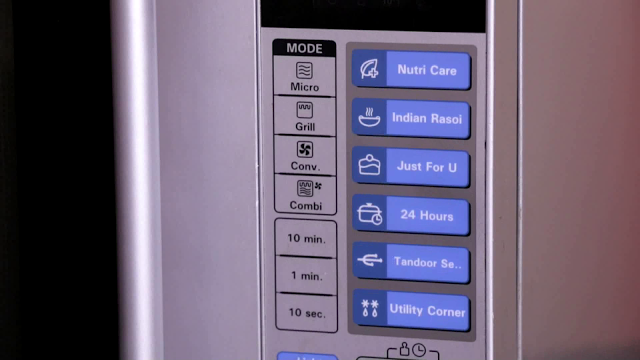 Of course, to know how to pre-heat your microwave of a different brand and model, you would need to refer that boring manual to see how you pre-heat it. If you can't find it as it happens often, look for it online. Preheating Time Microwaves usually take about 5 minutes to pre-heat, so I have the luxury of waiting till my batter is almost ready. But safer not to. I tend to forget once I get involved in the mixing process, so I start pre-heating ahead. If you are not as forgetful as me, by all means, wait until you have 5 minutes to go before the batter gets ready. How-To Preheat (Finally! ): To pre-heat, we will first need to keep the short rack inside. We need to keep the oven thermometer on the rack and put the microwave in convection mode. By default, the microwave will set at 180C. If you want to increase the temperature, keep pressing the same button. It will keep increasing by 10 degrees every time you press until it reaches 250C. That is the maximum in my microwave, I wish it went up higher, would be great for making pizza from scratch. Then press start. Now the turntable will start rotating. When the oven reaches 180 C it will display the temperature on the panel and sound a beep too. The oven will stay on(at 180C in this example) for about 20-30 minutes. In case you do not put something in and set the timer, it will get switched off after 20-30 minutes. If that happens as it sometimes does, you will need to preheat again. Normally in my microwave, the temperature on the thermometer and the panel match and I have no serious complaints about the way things bake in it. Touchwood! If there is a lot of variation between the temperature you set and the temperature the thermometer displays, and your bakes are not turning out properly, please get your oven checked by a qualified technician. Once you hear the beep, quickly remove the oven thermometer( as there isn't enough space to keep it on the rack along with the baking tin). Make sure the rack is in the center of the glass turntable and steady. Keep your baking tray in, set the timer as needed and press the Start button. One great thing about convection microwaves is it takes very little time to pre-heat. About 5 minutes to pre-heat to the maximum temperature of 250C. Once you turn the oven off, you can hear the sound of the oven cooling. Assume your recipe specifies 'bake 30 minutes at 180 C'. You set the timer for 30 minutes and remove the cake, you find that it needs a few minutes more. So, if you have just removed it from the oven just a few seconds earlier, immediately put it back in, set the temperature and the timer for say 5 minutes and press start. I don't find the need to pre-heat all over again. If the oven is turned off, be sure to put the oven back in convection mode, and then set the temperature and the timer. But if has already been a couple of minutes, the oven will have started cooling( you can hear the fan). You will need to pre-heat again and bake as needed. Check how your oven works, how long it maintains the temperature once it is turned off and you will get a better idea. If you would be baking multiple trays of cookies, try to keep next tray ready before the one inside the oven comes out. If in doubt, pre-heating the oven again is a safe bet. So this was about pre-heating, here are a few more videos about ovens you may like to watch. How To Use A Convection Microwave. Please share these videos if you find them helpful, it will help me in reaching out to more people! And of course, do not forget to subscribe to my channel for more videos! Baking Stuff From The USA Every Baker Dreams Of!